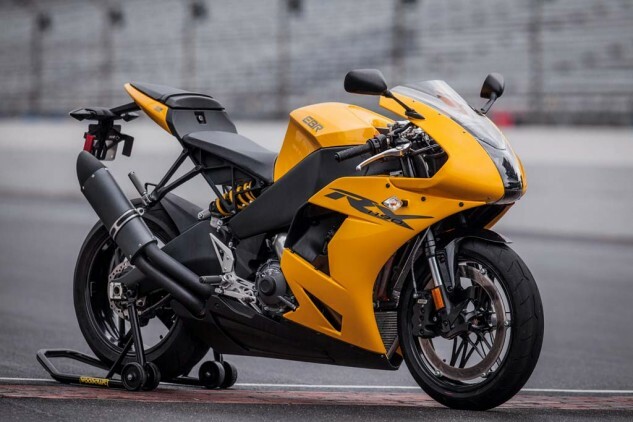 From rags to riches and back to rags again, the formation of Erik Buell Racing, or EBR, is testament to Erik Buell’s unwavering belief in himself and his quest back toward the path of riches. Although he has experienced the full range of emotions during his career, if there’s one thing Buell is not, it’s a quitter, and the closure of Buell Motorcycle Company wasn’t going to stop him. In the spirit of the American dream, Buell uses setbacks as fuel for the immense fire burning inside him – one with a very clear and singular focus: to create the ultimate sportbike, and to create it in the U.S. of A. 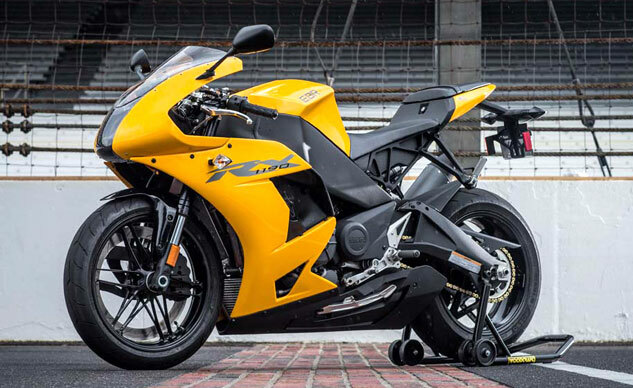 Well, ladies and gentleman, Erik Buell’s dream has come to fruition in the EBR 1190RX. It would be easy to mistake the RX as a glorified Buell 1125R, but that would be entirely wrong. The 1190RX is an altogether different motorcycle. For starters, let’s clear up a common misconception: EBR purchased the rights to the 1125R engine from Rotax, developing it further and even building it entirely in-house at the EBR production plant in East Troy, Wisconsin – the same location the former Buell Motor Company plant was located. No longer will America simply be known for its cruisers. With the EBR 1190RX, the USA has entered the sportbike arena, guns ablazing. To punch the 1125 out to 1190cc, the 72-degree V-Twin grew in bore size, creating a highly oversquare bore and stroke of 106 x 67.5mm. Cooling jackets were then revised to accommodate the bigger cylinders. From a bottom-end perspective, things are relatively similar between the old and new. Surprisingly, EBR reps say the only mechanical component remaining the same between the 1125 and 1190 is the transmission. Whatever you do, don’t call the engine in the EBR 1190RX a Rotax! A bigger bore accounts for the displacement hike over the 1125, while improved heads swirl the air/fuel mixture for a better boom and more power than even the 1190RS. Note the adjustable peg and rear brake lever. Also note the radiator fan and its surrounding ducting used to keep hot air away from the rider. To do this, offset intake cam lobes open the valves at different times. One opens first, followed by the other, with both reaching the bottom of their stroke at the same time. This creates the swirling effect in the combustion chamber, which provides better fuel atomization. The air/fuel mixture is then squashed at a lofty 13.4:1 compression ratio, where the resulting explosion occurs. According to EBR, the 1190RX makes 185 hp at 10,600 rpm and 101.6 ft-lbs at the crank. Published reports have the RX putting down just over 160 hp and 87 ft-lbs to the rear wheel. Factor in 10% drivetrain loss, and these numbers seem on point. EBR says the RX makes 10 horses and five ft-lbs more than the ultra-exclusive 1190RS, all due to the swirling intake effect, which is something the RS does not have. As an added bonus, better combustion means less pollution, and EBR claims the 1190RX passes the latest emissions tests with flying colors – emitting only 26% of allowable emission levels. On the electronics side, the RX features traction control developed entirely in-house with a whopping 20 different settings (21 including off), which EBR’s test rider and AMA Pro Superbike pilot, Cory West, helped fine tune. Steffanelli says the wide range of settings was designed to accommodate the equally wide range of rider abilities and circumstances they might face. The system uses a rear-wheel speed sensor, combined with predictive and reactionary algorithms, to cut fuel, spark, or both, depending on the severity of the slip incident. This is made more impressive when you consider the RX still uses throttle cables and is not ride-by-wire. 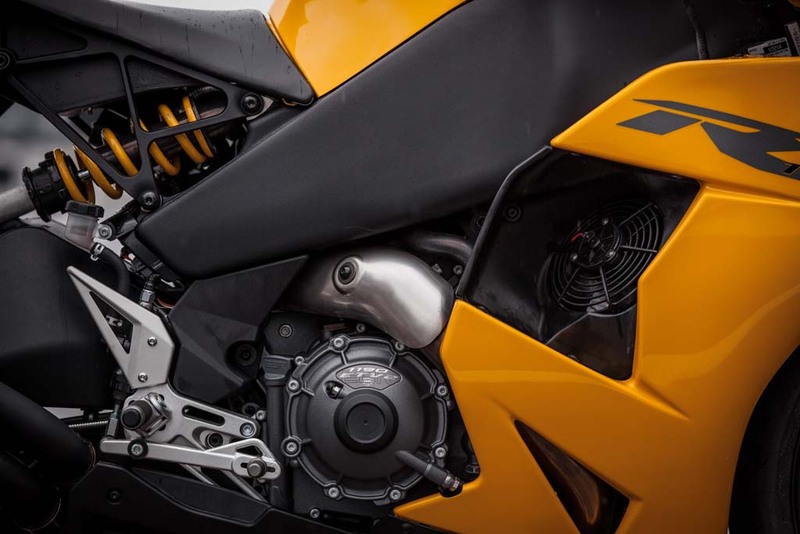 The bike doesn’t feature different power modes, but EBR feels the higher settings of the TC (resulting in more intervention) will help assuage the fears less experienced riders will have about opening the throttle on such a torque-heavy motorcycle. As a convenient side effect, higher TC levels also operates as a wheelie control function as well. 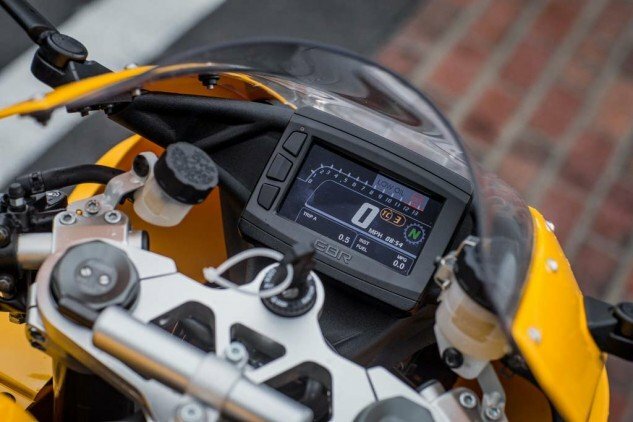 The full-color TFT digital display is a nice touch for the premium-priced 1190RX. Gauges include the obvious, like speedo and bar graph tach, but also incorporates a gear-position indicator, TC-level indicator, dual tripmeters, MPG calculator, and much more. The three buttons on the side are needed to manipulate different functions within the menu screen, including TC. While the engine work is impressive, Erik Buell is known for his outside-the-box engineering when it comes to chassis dynamics, and the 1190RX is no different. “We tell our new hires to engineer as much air out of the bike as possible,” Steffanelli says. “The only air we should have is in the airbox and the cylinders.” We’ll assume Tony also wants air in the tires, but otherwise, in signature Buell style, the aluminum frame doubles as the fuel tank, carrying 4.5 gallons. The benefit here is consistent feedback from the bike, no matter the fuel load. This way, “The bike feels the same whether you have four gallons or one,” Steffanelli says. Torsional rigidity was important in the chassis design to provide maximum feedback to the rider. As such, both the frame and swingarm are bolted directly to the engine, making it a stressed member. A cast magnesium subframe is incredibly light and keeps weight centralized. Showa handles suspension duties at both ends with a Big Piston Fork and single, linkage-less shock. Both units are fully adjustable and are tasked with communicating what’s happening underneath the 120/70-ZR17 front, 190/55-ZR17 rear Pirelli Diablo Rosso Corsa tires, which are mounted on cast-aluminum wheels. 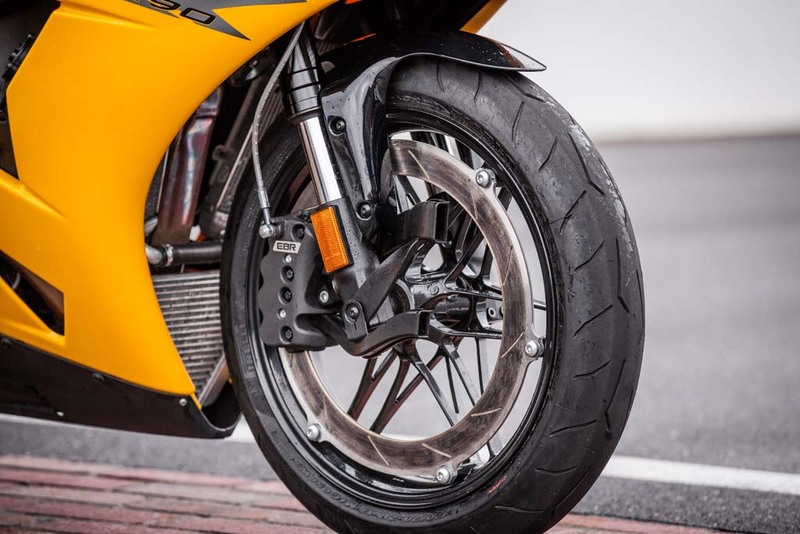 The second benefit is less unsprung weight compared to a traditional sportbike’s twin-disc brake configuration, as there’s only one disc, one caliper, and one (steel-braided) brake line. Not to mention the carrier is removed from the equation entirely. ABS is not yet available on the RX, but a system is currently in development. 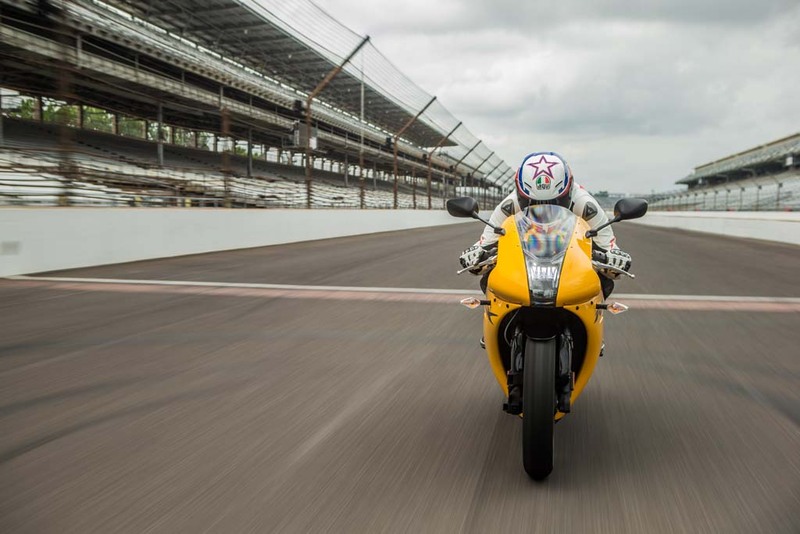 The EBR story is as American as it gets, so what better venue to put the 1190RX through its paces than America’s racetrack: the world-famous Indianapolis Motor Speedway. 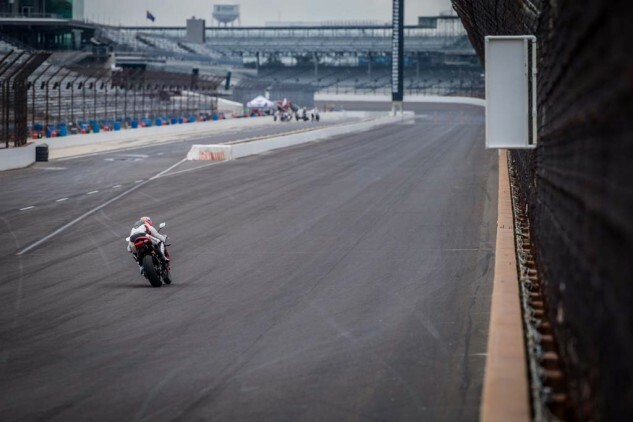 As the first motorcycle manufacturer to be granted access to test on the Brickyard’s hallowed grounds, this is an important chapter in the Erik Buell story. Erik himself was supposed to be in attendance to proclaim the virtues of the 1190RX, but a family emergency required his immediate attention, leaving the bike to do all the talking. Turns out, Erik didn’t need to say a word. 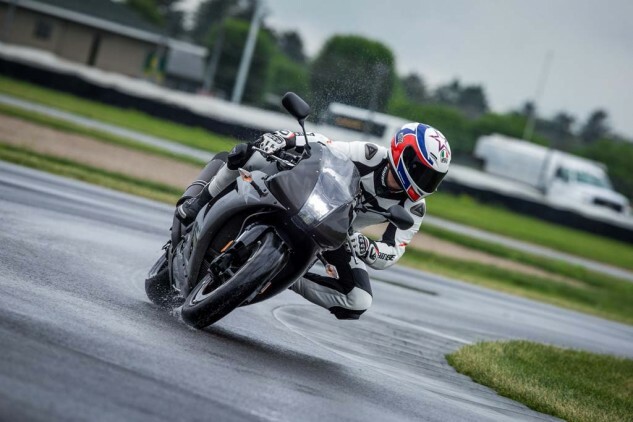 Despite morning rainfall that left the track entirely wet, the 1190RX surprised with its confidence-inspiring nature and manageable power delivery. Without any rain tires in sight, EBR sent us out on the wet and unfamiliar track with the stock Diablo Rosso Corsa tires. Development rider West advised we bump the TC to a rather intrusive 15. Definitely not ideal conditions. The newly repaved Indy road course has a surprising amount of grip in the wet. So, too, do the Pirelli Diablo Rosso Corsa tires. Just in case I overstepped those boundaries, however, the TC cranked high made sure everything stayed in line. Bright white LED lights for both high- and low-beam are hard to miss. To help calm my nerves I sat on the bike to familiarize myself with the controls and ergos. The familiarization process didn’t take long, as the saddle perches the rider in the attack position, but not overly so. Seat height is 32.5 inches from the ground, and though I couldn’t flat foot, my 30-inch inseam could comfortably place the balls of both feet on the ground simultaneously. In a tuck, I could scoot back in the seat, but even then elbows were touching knees. 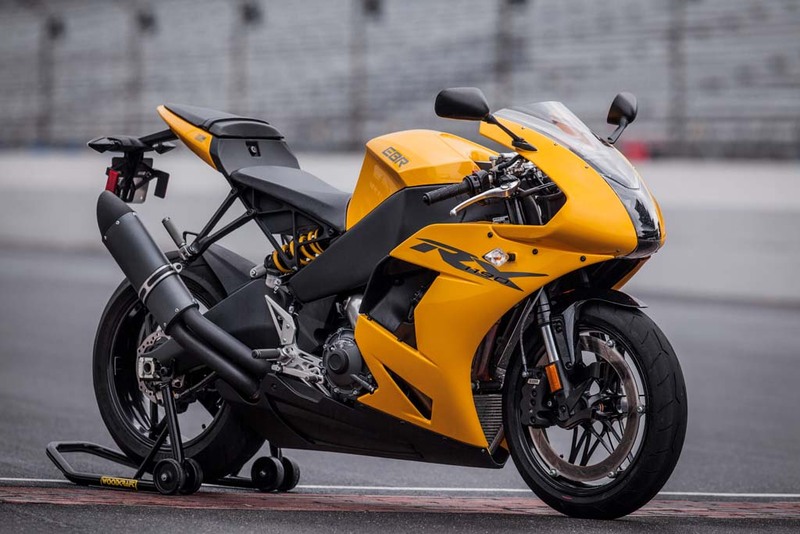 EBR paid close attention to the varying sizes of riders who may occupy the saddle, and as a result, not only are the clutch and brake levers adjustable, but so are the pegs and toe levers for the rear brake and shifter. While a dry track is always preferable to a wet one, the soggy conditions in the morning were great for sussing out the RXs driveability. Fuel is metered well, and twisting a throttle cable instead of exciting electrons gives a very connected feel between right wrist and rear wheel. Still, with TC only five clicks away from its maximum setting, power interruption when getting on the gas was severe, but even at this early stage, it was clear the RX had plenty of grunt in its belly. Moving TC down to level 10, which must be done at a standstill, allowed a little more slip, but it still felt highly intrusive, even for these damp settings. With the track drying, we could further explore the capabilities of the chassis. The RX is confident heading through fast sweepers like this one. Thankfully, a slight breeze and occasional sunshine dried the track later in the afternoon, where the bike’s true nature came to light. With the throttle pinned coming onto Indy’s famous front straight, the roar of the V-Twin sounds guttural and mean. 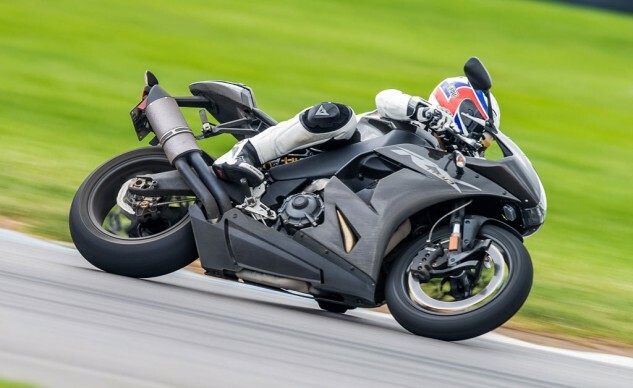 I was disappointed to have to blip for each upshift, as these days an $18,995 motorcycle is simply expected to to be equipped with a quickshifter. Otherwise, clicking into each gear in either direction returned clear and positive shifts. As I crossed the yard of bricks, pegged at the top of fifth gear, I glanced down to see 154 mph on the digital speedo before quickly looking back up for my braking marker. Letting off the throttle sends the chain idler in motion to keep proper tension. In the process, it lets out a futuristic-sounding squeal Sci-Fi-loving motorcyclists would no doubt enjoy. The high-pitched sound is counter to that of the throaty exhaust note but equally cool, in my opinion. A squeeze of the brake lever and two backshifts scrubs the necessary speed before the high-speed Turn-1 sweeper. The RX never steps out of line and confidently rails through the turn. Another downshift comes before the double-apex Turn 2 right-hander. It’s a perfect opportunity to trailbrake into the turn and, as the RX runs a little wide, use the front binder to help tighten the line a little more. Feel from the perimeter brake is excellent. 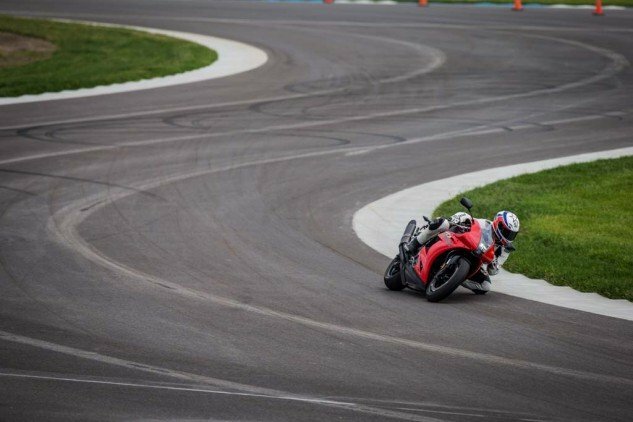 Further into the infield, a right-left-right succession of turns demonstrates the EBR’s impressive chassis agility. A sharp 22.4-degree rake, 3.8-inch trail and short 55.5-inch wheelbase makes the roughly 450-lb (fully fueled) 1190RX seem almost effortless to turn and transition. For comparison, the Ducati 1199 Panigale sports 24.5-degree rake, 3.9-inch trail and 56.6 inches from center to center. Almost cruiser-like in comparison. Coming out of this trio of turns leads to the back straight, where getting on the power early is crucial. Feeding in the coals is smooth and predictable, with power coming on strong especially through the midrange. TC would intervene even in level 3 (as indicated by the flashing symbol on the dash), but at this point it was becoming increasing difficult for me to tell. By the end of the back straight, at approximately 130 mph in fourth gear, it’s hard on the brakes again for a hairpin left. Bang off two downshifts, and the vacuum-assisted slipper clutch gently lets the tail wag before tip-in. No muss, no fuss. At TC level 3, drive coming onto the front straight was strong, with just a hint of intervention, communicated with a slight disconnect between throttle hand and back tire. Had there been more dry track time, I would have liked to experiment with even lower levels of TC. With each continuing lap, my confidence was growing higher and higher aboard the 1190RX. I distinctly remember being impressed with the handling characteristics of the 1125R during its launch at Laguna Seca a few years back but noted how more power – as well as some more refinement – would be welcome. With the 1190RX, EBR has come a long way towards that goal. That’s not to say I don’t have gripes. As mentioned earlier, a quickshifter is required kit in this playing field. Also, a taller windscreen would be appreciated – the upper edge of the shield is just below my line of sight while in a full tuck. Solving these two issues would be among the first things I’d tackle were it mine. From there, the issues become a bit more complex. Firstly, while I admire the clarity from the full-color TFT display when it’s clean, some dried off water spots from the day’s earlier rains made the gauges hard to read, especially in a tuck. Also, and more importantly, the bars buzz considerably at high revs. For a first offering from a small company, I’d say EBR more than exceeded expectations with the 1190RX. Its engine has enough grunt to satisfy even the most experienced of riders, while literbike newbies can dial in just the right amount of TC in order to not scare the bejeezus out of themselves. Meanwhile, the RX continues Buell’s tradition of being a fine-handling motorcycle, able to carve a corner with the best of them. We think EBR’s package will be competitive with Ducati’s sensational Panigale, boasting more midrange power, friendlier ergonomics and greater agility. Erik Buell is back, folks, and if the 1190RX is just a sign of what’s to come, then we can’t wait to see what Erik’s got up his sleeve next. The streetfighter-themed 1190SX was revealed the day of our ride, and an 1190AX, presumably an adventure bike similar in concept to Buell’s Ulysses, has been teased on EBR’s website.